The Hampstead Theatre has managed to give further life to a couple of their Downstairs productions to other theatres, but Di and Viv and Rose marks the first time that one has been promoted to a full run in their main house. Happy news for me as I loved the play when I saw it back in 2011, though I was a little saddened to see that it wasn’t the original cast being brought back with this three-hander. 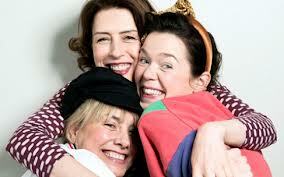 Tamzin Outhwaite has returned but Claudie Blakley and Nicola Walker have been replaced by Anna Maxwell Martin and Gina McKee respectively, in Amelia Bullmore’s wonderfully frank and funny take on friendships. My review of the original production can be read here, and my review of this new version for The Public Reviews from a more objective perspective is here, so I’ll just limit myself to a bit of a compare and contrast exercise here. By and large, I loved the play just as much second time around and it probably had a greater emotional impact due to the knowledge of what was to come in terms of the more dramatic moments. Bullmore has tweaked the play a little, adding a scene to the beginning of the second act but it has been seamlessly done and if I hadn’t have read the programme note about it, I doubt I would have noticed. Performance-wise, it was interesting to revisit a production that had partially refreshed its line-up as it simultaneously reminded me of before and made its case for the new incarnation of these three friends. Outhwaite maintained her excellent mix of feistiness and vulnerability as the forthright Di, most affecting as the one who feels the bonds of friendship the strongest with the accompanying highs and lows. Personally I wasn’t quite as keen on Gina McKee’s take on the buttoned-up Viv with a somewhat more abrasive side than Nicola Walker previously portrayed, but I thought Anna Maxwell Martin truly excelled as Rose. Claudie Blakley was impressive with a daffily comic interpretation of the emotionally and sexually open art history student but Maxwell Martin really dug deeper into the character of Rose to create a more rounded persona, less overtly funny perhaps but more believable in inspiring the kind of love and devotion that makes her such an adorable presence. Her ability to mix the funny and the profound perfectly complements Bullmore’s pitch-perfect writing which really explores the changing paths that friendships take across our lives with insight and wit, making Di and Viv and Rose once again one of the hottest tickets in town.